We're hitting the road! Sweet Grief, a painting & poetry collaboration by Senitila McKinley and myself, is heading to the Benton County Museum in Philomath, Oregon. Will you join us for the party? We're happy to share the exhibition with Permission 2 Play, a support-through-quilting group for cancer patients. The quilters, both novice and experienced, share their passion for textile arts, try out new and interesting techniques, and give themselves "permission to play." Sweet Grief debuted in April 2012 at the Windermere Triad Gallery in Seal Rock, Oregon, where it enjoyed an eight month-long run. 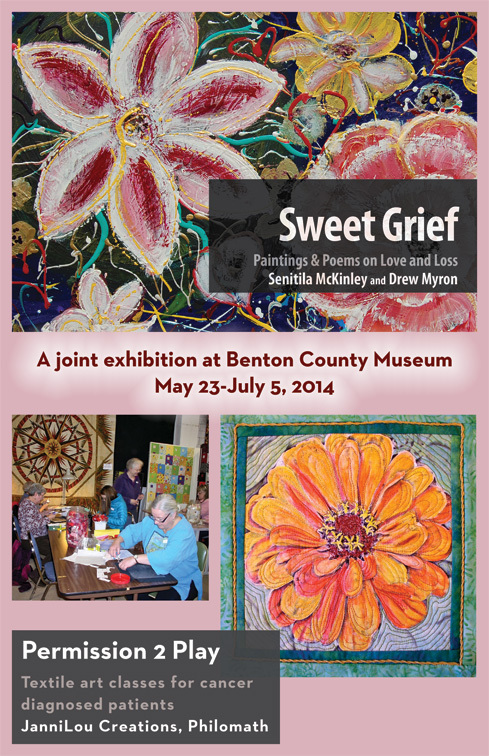 In 2013, Sweet Grief was on display at the Visual Arts Center in Newport, Oregon, and in Summer 2014 the show exhibit at the historical Benton County Museum. To learn more about Sweet Grief and the special-edition exhibition book, visit Push Pull Books.